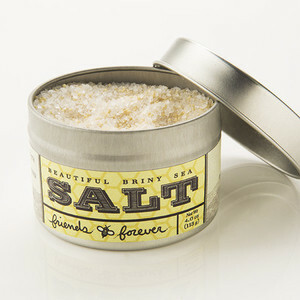 Beautiful Briny Sea Friends Forver Salt - A sweet 'n salty blend of honey and sea salt. This salt creation from Atlanta's Beautiful Briny Sea is the perfect marriage of sweet and salty. Made by combining honey with pure ocean salt, this blend is fantastic on popcorn, ice cream (that's right! ), spinach salad, and sweet potatoes.